Sometimes when I do home improvement projects things start to snowball. It’s starts out as replacing the flooring, then the kitchen cabinets need painting, then a new countertop has to be installed, followed by new appliances, and what do you know…a new backsplash! What can I say, when I get on a roll with my home improvements I go a little overboard and no stone is left unturned. That’s the case with my new kitchen backsplash. The only problem was after using most of our home improvement budget for new floors, a few new appliances, and a new countertop there wasn’t much money left to replace the backsplash, so I took the internet and found a cool, cost-effective solution that would save me from ripping out my old tile and trying my hand at installing new tile, which I can guarantee is not in my skillset. The product I found is called Smart Tiles. The idea is simple; they are basically tile-like “stickers” that you stick over your existing tile to create a new look for your backsplash. 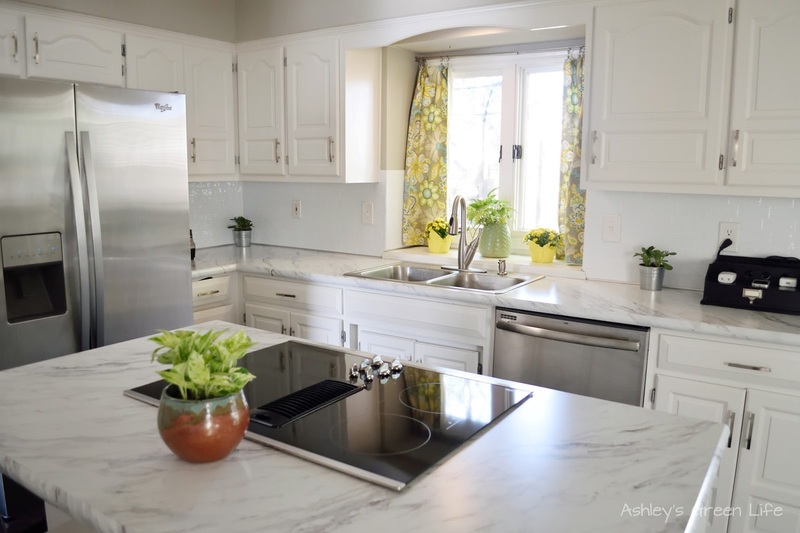 If you don’t already have a tile backsplash, you can also use the Smart Tiles too, you just place them on the wall in your kitchen or bathroom. 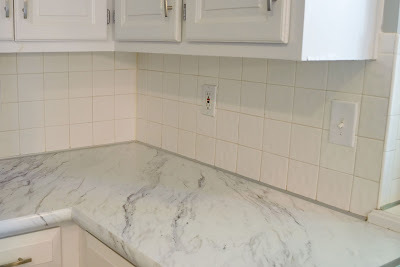 What motivated me to want to change my backsplash in the first place were the dated, off-white tiles that remained probably from back when my house was built in the 70s. I thought they might look okay once I painted my kitchen cabinets white, but all it did was highlight the off-white color and also I really started to notice the textured, slight bevel look the tiles had, not to mention the old grout was looking very yellow. Eww, I was not a fan. These days when subway tiles are all the rage, not grid-like square tiles I like had, so I knew I needed an update. Thank goodness I found Smart Tiles. On their website they have styles that range from a variety of colors and tile sizes. My personal favorite tile-style called “Metro Blanco.” It was a crisp, bright white, large subway-style tile, which I thought would go great in my newly painted white kitchen. So I contacted Smart Tiles and they sent me the product to try out in my kitchen. The tiles are sold in sheets and each sheet costs about $7.99 (other styles have different prices) and you figure up how much surface area you need to cover and then purchase that amount of sheets. For my project I needed to cover approximately 20 sq. ft. so I needed about 40 sheets of the Metro Blanco tile. Which works out to be about $320. Then I got to work. After watching several Youtube videos about the installation of the SmartTiles and re-reading the instructions, I was ready to get started. Thinking it would be a quick project; I planned to do it during my girls’ nap one afternoon. 2. Remove outlet and light covers. 3. 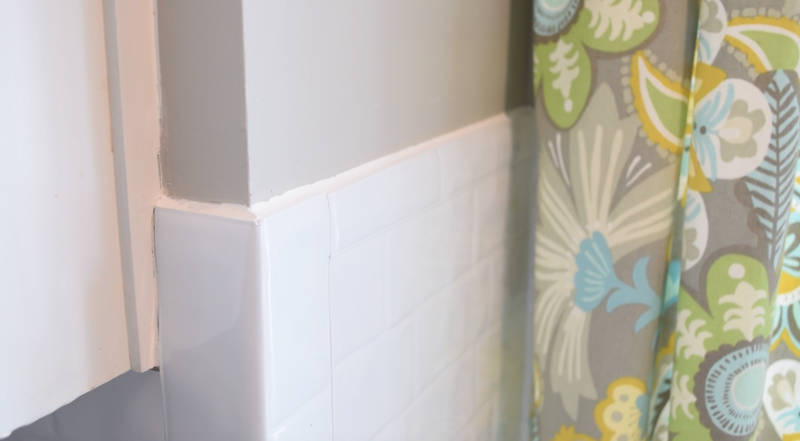 Start installing the Smart Tiles in the corner and work your way out and then start on the other side making sure to overlap the grout lines as you go. 4. Measure around outlets and cut the Smart Tiles accordingly before placing on the wall. Unfortunately once I got started, I realized this was no easy afternoon project. Once I started installing the Smart Tiles over my existing tile I had some trouble. Mainly the fact that the existing tile and it’s already made lines were messing with me big time. I could not get the Smart Tiles to line up nicely in the corners or on the wall. 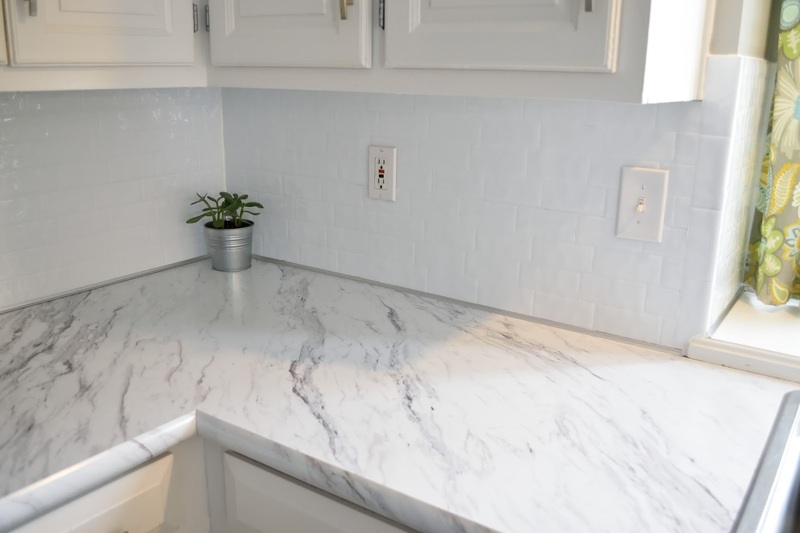 Also, in the installation videos I saw the tile sheets seemed to be more symmetrical and even, but with the subway-style look of my Metro Blanco tiles, things did not line up as perfectly, which made cutting it even harder (for me). of the previous tile made things a little more confusing! So that’s when I called in my project helper, my husband Brandon. He installs duct work for a heating and cooling company for a living so taking measurements and cutting out supplies are things he does all day, every day. He had no quams about measuring and cutting out the tiles, where as I on the other hand would measure, re-measure, line it up, re-measure again, think about it some more and then if I was feeling brave, finally cut it. So with him by my side, he took on the measuring and cutting and I did the smaller work like filling in the smaller tile sections and staying away from the outlets and light switches…my least favorite part. Another challenge we faced was in my windowsill because the tile goes all the way into the windowsill which left us wondering, how do the tiles to go around a corner without having them pop up or open? Luckily the Smart Tiles team emailed us with some specific instructions for folding the tile vertically for this space and then treating it like a corner on each side. Once all the tiles were complete and in place, we went through and caulked the corners, and the tops. Then it was finally complete. Looking back at the install process, I’d have to say it was much more difficult than I planned, so if measuring and precise work involved in this project doesn’t seem like something you are good at, you may be better off hiring a pro and sticking with real tile. But if a good ol’ DIY is your thing, this Smart Tiles would be great for you. Since having the Smart Tiles installed for a few weeks now I’m loving the cleaner, brighter look and of course, the way it completely changed the look of my dated backsplash. It’s also much easier to clean and I really enjoy knowing that I didn’t have to send any of my old tile to the landfill, so kudos to Smart Tiles for that green factor! 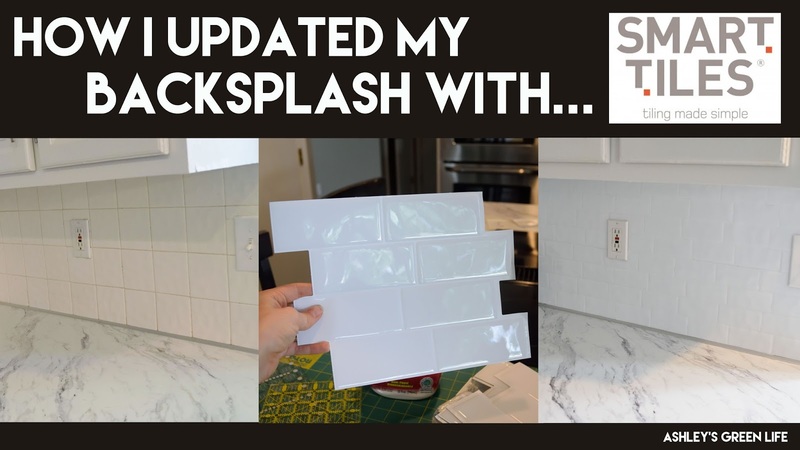 If you’ve ever installed a peel and stick-like tile for your backsplash before or this Smart Tiles product, share below! Or if you have any questions for me about the product or installation, feel free to post that below too. Disclaimer: Smart Tiles sent me these tiles for free to try for this video, all views expressed are my own. Vegan What I Ate Today: January...with Mila!